Page 73 discovers the best new voices of the American theatre and gives them the support they need. The Campaign for Page 73 will raise $2 million to do what we do even better and continue to make a massive impact on the new canon of American theatre. For twenty years we’ve honed our expertise in identifying and holistically supporting the most talented playwrights. We’re known as the go-to career launchpad for playwrights who go on to be defining voices in contemporary culture. Page 73 playwrights have gone on to win the Pulitzer Prize, the MacArthur “Genius” Grant, the Guggenheim Fellowship, Tow Foundation Playwright Residency, The New York Times Outstanding Playwright Award, as well as Tony nominations and wins at the Obie, Lortel, and Drama Desk Awards. We're strategically growing and strengthening our organization to increase our impact on the talented playwrights who will need us for years to come. We are raising $2 million to support the following three funds. We'll produce two full productions each season, independently. Our personal touch will best serve every Page 73 playwright while heightening our visibility in the field. We're building a mature artistic and administrative staff capacity to robustly support our playwrights’ work. With Board-managed funds on reserve, we will have the rare flexibility to take advantage of opportunities for the organization and our playwrights as they arise. 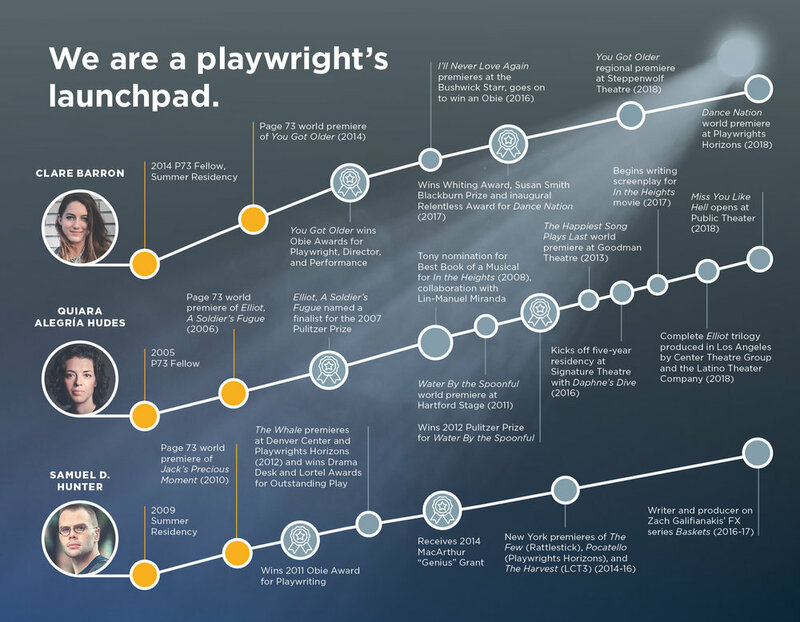 Together, let's celebrate all that our playwrights have accomplished in Page 73’s first twenty years. To learn more, contact Director of Development Rebecca Yaggy at rebecca@page73.org. *Special thanks to Carson & Joseph Gleberman and the Howard Gilman Foundation for generously matching donations dollar for dollar up to $250,000!